Here is how the Republican effort to overhaul the tax code is probably going to play out. Eventually, Republicans are going to figure out they can’t reform the tax code. 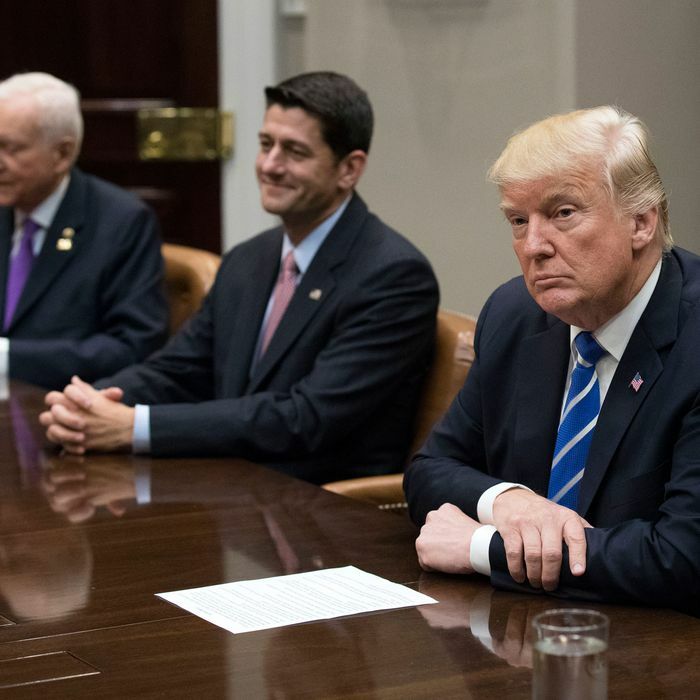 After their plan collapses, they will regroup, and come up with a plan B that consists of another Bush-style tax-cut bill. They will pressure recalcitrant members of Congress to vote for it, making the argument that another legislative failure will bring about a midterm-election debacle. The tax-cut plan will be unpopular, but less unpopular than the Obamacare-repeal plan that they tried to muscle through on the same basis, and it will pass. In the meantime, Republicans are spending a lot of time trying to write a tax-reform bill that is almost certain to fail. Indeed, it has essentially failed already. The Republican tax-reform ambition was, or is, to reduce the statutory business tax rate from 35 percent to a much lower level — 15 percent, or perhaps 20 percent, or at least 25 percent — as well as to cut other taxes, especially the tax on estates. Since all those tax cuts would reduce tax revenue, it becomes crucial to identify ways to pay for them. Budget hawks agreed to allow a $1.5 trillion tax cut over the next decade, which is not nearly enough to accommodate all the tax reductions Republicans crave. What’s more, budget rules prevent the Senate from enacting any revenue loss after a decade. Republicans have had two main ideas to accomplish this. Their first idea was a border-adjustment tax. The appeal of this tax is that it would have raised more than a trillion dollars in revenue, its burden would have fallen on the poor and middle class, not the rich, and Republicans thought they could sell it to President Trump as a form of economic nationalism (by taxing imports). But this change imposed concentrated costs on big-box retailers, who banded together and killed it. Their second idea was to eliminate the federal deduction for state and local taxes. This idea also had abstract appeal. Its burdens fell mostly on residents of blue states (which have state-level income taxes). Its enactment would secondarily advance another conservative goal — by creating a double tax on states that have income taxes, it would encourage them to shift to sales taxes or other regressive forms of revenue. And it would raise a healthy chunk of change — about $1.3 trillion. What’s more, many of the members in these districts are the same ones who cast painful votes to repeal Obamacare. They’ve already been asked to take one for the team. They are negotiating to keep most or all of the deduction in place. So there go the biggest and best ideas Republicans had for tax reform. Yes, their plan claims to have intentions to eliminate other exemptions and deductions later on. 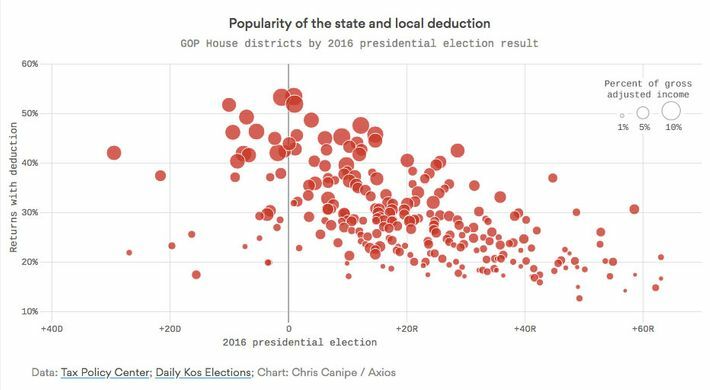 But the whole trick in tax reform is to find ways to offset the cost of reducing tax rates. Their two best ideas have been shot down, they’re trillions of dollars in the hole, and there’s no indication the next idea they fall back on will fare any better. Whatever plan C they come up with, it probably wouldn’t work as well as plan A or B would have. In fact, the whole way they’re approaching this policy virtually guarantees failure. The GOP strategy is to craft a policy among Republicans only. (That’s because Democrats are only willing to support tax reform that does not deliver a net benefit for the rich, and delivering a net benefit for the rich is the entire purpose of the exercise.) Having limited the universe of potential supporters to narrow majorities, every Republican has the leverage to veto any provision that hurts an important constituency. And since you can’t raise real revenue without hurting an important constituency, they are dead in the water. Eventually they’ll realize this, and scrap the entire notion for a nice big tax cut. What’s amazing is that Republicans don’t yet realize tax reform is dead.